Take a trip to Cotswold Wildlife Park in Oxfordshire this week and you will no doubt meet two tiny new giants while visiting. 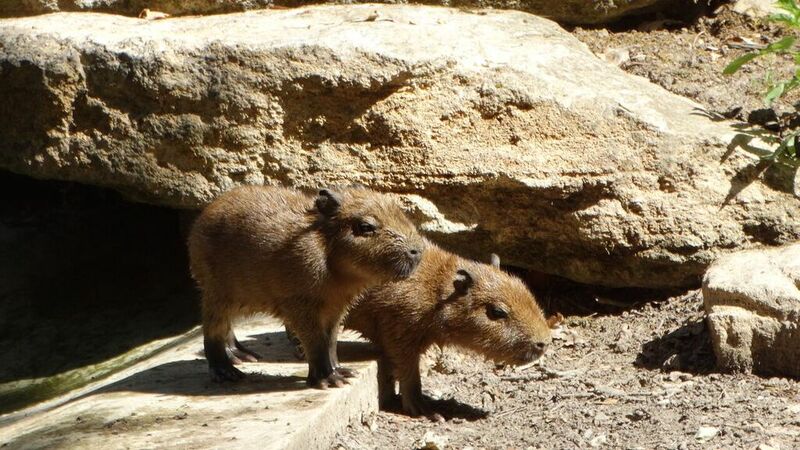 The capybara babies arrived just days ago and were only discovered when keepers were on their rounds. Due to their large barrel-like build, keepers were unaware that mum Belle was pregnant until they discovered the newborn twins by her side during their morning routine checks. The capybara is a giant rodent species from South America and has been described by zoologist Desmond Morris as “a cross between a Guinea-pig and a Hippopotamus”. It is the largest living rodent in the world and the last remnant of a long line of gigantic grass-eating rodents that evolved in South America over millions of years. Their scientific name (Hydrochoerus hydrochaeris) means ‘water horse’. Curator of Cotswold Wildlife Park, Jamie Craig, commented: “Capybara babies are always extremely popular with the keepers and our visitors. They are born looking like a miniature version of their parents and are soon exploring the enclosure and swimming in their pool. We have had great success with this species over the years and it is reassuring to know that this new pair will continue that tradition”. Water is a vital resource for this semi-aquatic species; it is used not only for drinking, but also to control their body temperature and as an escape from predators. Capybaras usually mate in the water and can even sleep underwater by leaving their noses exposed to the air. Their water-resistant fur, partially webbed feet and position of their eyes and nostrils on the top of their heads enables them to remain almost completely submerged but still able to hear, see and smell what is happening on dry land nearby.